Working in communications for Threads of Life, my primary objective is to share the stories of the families Threads of Life supports and to demonstrate how necessary ongoing, accessible family support is to their coping and healing. I hope to help others see the magnitude of loss contained in the statistics. The faces behind the stats. The families living with a forever-hole in their hearts. This is a loss I know intimately as a sister to a brother who was severely disabled at work, and subsequently died of his injuries. As a daughter to two parents whose son died a long and painful death because his safety wasn’t adequately protected at work. As a friend to far too many other siblings, parents, partners, children and friends who’ve known this particular heartbreak. 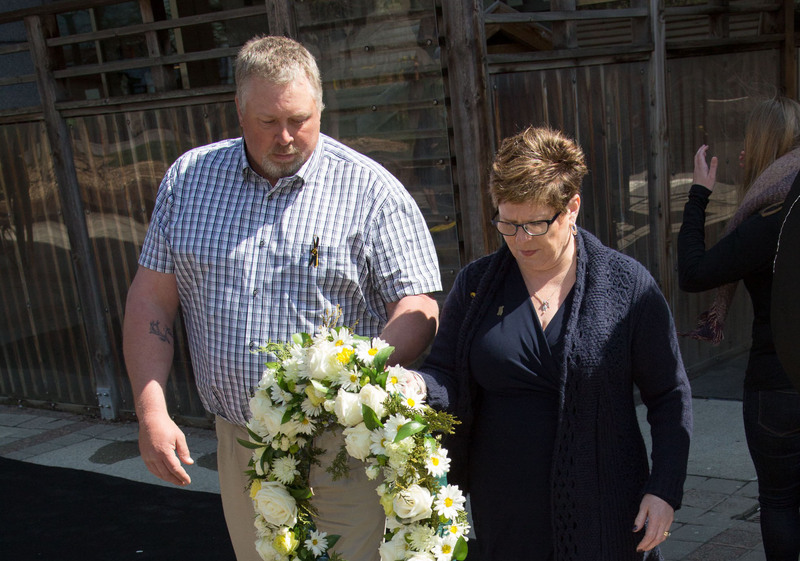 Photo: Threads of Life family members Rick and Elaine Keunen lay wreath at 2017 Day of Mourning ceremony. I didn’t know of the Day of Mourning or its significance until I attended my first ceremony in honour of my brother, who sustained severe electrical burns at his summer job almost 17 years ago. While I do see more people recognize the significance of this day now, I’m sure there are many who, like me, don’t know of its significance until they were touched by a workplace tragedy. Additional heart-weight on an already heavy day. For our family members—our Threads of Life family—please be gentle with yourself here. If you would like to attend your local Day of Mourning ceremony, we’ve linked to provincial/regional listings (as they become available) here on our website to help you find the info you need. If attending your local ceremony feels like too much for you at this moment, then please know that others are standing to mark the day in your honour. Any way you choose to acknowledge the significance of the Day of Mourning is what’s right for you. You already carry this knowing acknowledgement with you every single day. Beautifully said Sarah. For those who aren’t ready to, or are just not able to, there will always be another Threads of Life family member attending a Day of Mourning ceremony somewhere… And when we are there, we are honouring all of the sons, daughters, fathers, mothers, sisters, brothers… all of the lost family members of our families as well as those who haven’t found us yet.